First pattern - A passes to B (who is checking away from his cone). B receives with the outside foot and hits the pass with the other (speed of play). C takes a positive touch and dribbles at pace to the end of the line. Second Pattern- A passes to B. B lays it off to A. A passess to C. C Dribbles to the end of the line. Third Pattern - Add a combo between B and C. (B has checked to the middle of the field. 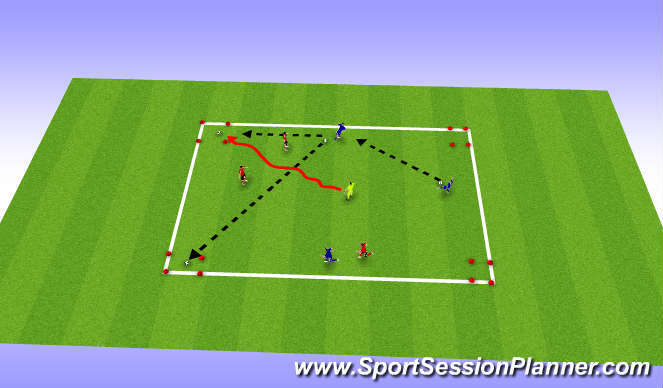 3v3+1 - Players create runs adn receive the ball in the corner areas in the direction they are attackin to earn a point. No more than 2 touches in the grid. First team to 3 wins. Loser has a punishment. 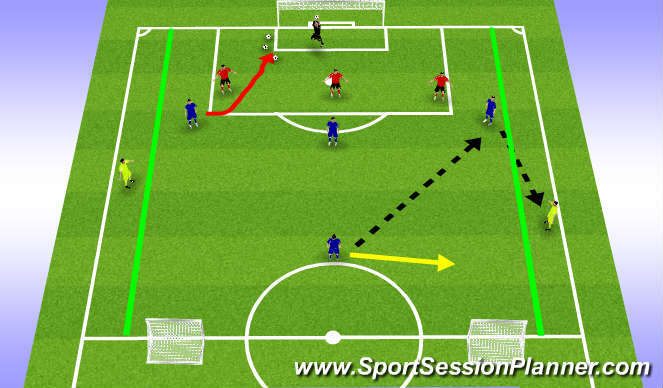 Spacing and using the offensive area efficiently. If the defenders take the ball, they may use the wide players to play out and finish in the small goals for two points.